BOSTON, MA--(Marketwired - Nov 3, 2015) - Fantastic Sams has partnered with Operation Reinvent to give female U.S. military veterans a leg up as they reenter the civilian job market. Operation Reinvent holds workshops on or near military installations. Its goal is to offer image makeovers, interview coaching sessions, and more to help women transition more successfully to the civilian job market as they leave active service. "There's no such thing as a second first impression," says Julie Lewit-Nirenberg, founder of Operation Reinvent. Fantastic Sams was the first nationally franchised hair salon and has grown to more than 1,100 locations over the past 40 years. Unlike discount haircut franchises, Fantastic Sams offers the full range of salon services, including haircuts and trend-right styles, color, and waxing, which helps generate higher tickets and margins. Fantastic Sams invented the no-appointment-needed hair salon, and continues to be an industry leader. In September, teams from Middle Tennessee Fantastic Sams salon franchise locations provided cuts and styling to around 40 women at Fort Campbell. As Operation Reinvent moves around the country, more Fantastic Sams teams will get the opportunity to take part, as well, says Linda Chadwick, president and CEO. 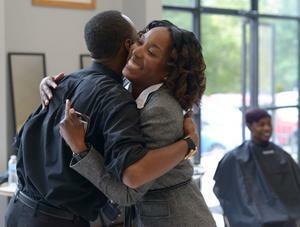 "All of our franchise owners and stylists love to find new and creative ways to give back to the communities they serve," Chadwick said. "What better way than to give back to our female veterans, who have given so much to their country? These women face many challenges as they readjust to civilian life, and if Fantastic Sams can help them feel better and more confident as they apply for jobs and seek other opportunities, we are going to jump at the chance every time." Many former service members face challenges as they readjust to civilian life, but women often have additional roadblocks. According to the U.S. Bureau of Labor Statistics, female veterans have an unemployment rate of 11.2 percent, five points higher than their male counterparts. They also often receive job offers below their skills and abilities, according to Operation Reinvent. "Female veterans struggle to reconnect with their long-suppressed femininity, have low visibility and recognition, and a lack of career transition support," Lewit-Nirenberg said. "Operation Reinvent is dedicated to meeting those challenges beginning with our unique, for-women-only GET THE RIGHT JOB career transition and employment training program, which incorporates hands-on professional image development and real-time job search opportunities." Going forward, Operation Reinvent hopes to hold its workshops on a quarterly basis at as many military installations as possible so that it can continue reaching female veterans as they leave the service. And Fantastic Sams hopes to participate in as many of these as possible. "We work with a lot of veterans when they open a Fantastic Sams franchise location," Chadwick said. "So we are familiar with the challenges all veterans face, and when we learned of the extra issues that women in the military face as they transition out of service, we knew we could offer some extra support. We are thrilled to have this new way to give back." 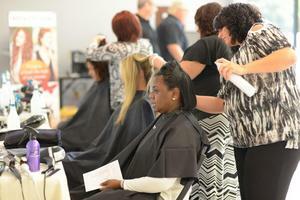 In addition to getting valuable job-interviewing skills, female veterans at Fort Campbell also received cuts and styles from area Fantastic Sams salon franchise stylists. Fantastic Sams is thrilled to partner with Operation Reinvent and hopes to increase participation across the country.